P uzzles, anchors, stars, and plowhorses; those are a few of the terms consultants now use when assembling a menu (which is as much an advertisement as anything else). “A star is a popular, high-profit item—in other words, an item for which customers are willing to pay a good deal more than it costs to make,” Poundstone explains. “A puzzle is high-profit but unpopular; a plowhorse is the opposite, popular yet unprofitable. Consultants try to turn puzzles into stars, nudge customers away from plowhorses, and convince everyone that the prices on the menu are more reasonable than they look.” Poundstone uses Balthazar’s menu to illustrate these ideas. That’s the prime spot where diners’ eyes automatically go first. Balthazar uses it to highlight a tasteful, expensive pile of seafood. Generally, pictures of food are powerful motivators but also menu taboos—mostly because they’re used extensively in lowbrow chains like Chili’s and Applebee’s. This illustration “is as far as a restaurant of this caliber can go, and it’s used to draw attention to two of the most expensive orders,” Poundstone says. The main role of that $115 platter—the only three-digit thing on the menu—is to make everything else near it look like a relative bargain, Poundstone says. 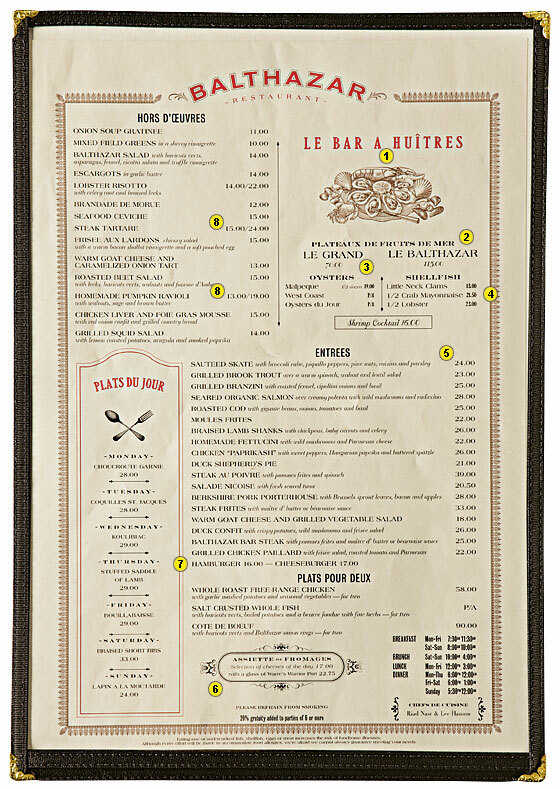 At a mere $70, the smaller seafood platter next to Le Balthazar seems like a deal, though there’s no sense of how much food you’re getting. It’s an indefinite comparison that also feels like an indulgence—a win-win for the restaurant. The restaurant’s high-profit dishes tend to cluster near the anchor. Here, it’s more seafood at prices that seem comparatively modest. That’s where low-margin dishes that the regulars like end up. The examples here are the easy-to-miss (and relatively inexpensive) burgers. Excerpted from Priceless: The Myth of Fair Value (and How to Take Advantage of It), to be published in January by Hill & Wang, an imprint of Farrar, Straus & Giroux. © 2010 by William Poundstone. All rights reserved.